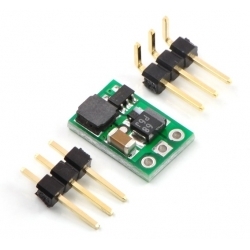 This extremely compact boost regulator generates 5 V from voltages as low as 0.8 V and delivers up to 200 mA, making it perfect for powering small 5V electronics projects from 1 to 3 NiMH, NiCd, or alkaline cells or from a single lithium-ion cell. 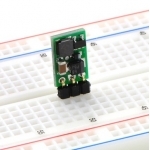 This tiny boost switching regulator is based on the NCP1402 boost regulator IC. Its small dimensions of just 0.33" x 0.5" (8.4 x 12.7 mm) and a startup voltage of down to 0.8 V make it easy to build 5 V circuits that are powered by lower battery voltages. The available output current and output voltage ripple depend on the input voltage. 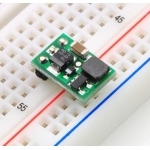 With a 0.8 V input, approximately 5 mA are available before the output voltage begins dropping. The full 200 mA output can be realized from input voltages over approximately 2.7 V. With low input voltages, the output voltage ripple is under 40 mV peak-to-peak; close to 5 V, the output ripple quickly climbs to 150 mV peak-to-peak. 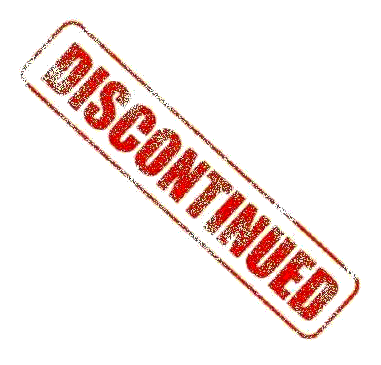 Therefore, adding capacitance from the output to ground is recommended for noise-sensitive applications with input voltages close to 5 V.
Powering 5 V systems from lower-voltage batteries. 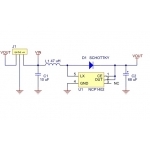 Powering 5 V subsystems (e.g. sensors) in lower-voltage (e.g. 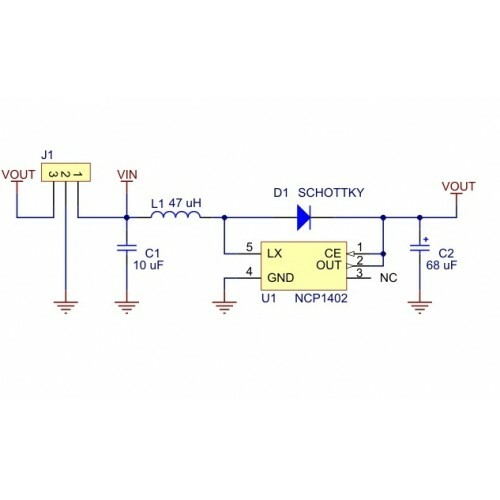 3.3 V) systems.